I admit that I put rhubarb in a lot of things. This is one ‘barb recipe that would never have occurred to me, however. I got the idea for these fudgy squares from Dennis Duncan of High Altitude Rhubarb, a bustling organic rhubarb farm in the foothills of the Rocky Mountains in Colorado. Like me, Dennis is a major rhubarb fan. Dennis was a little vague about how much rhubarb to add to the brownies, suggesting that I simply add unsweetened rhubarb to my favorite brownie recipe. So I just punted. I wasn’t sure whether the brownies were a success … until my neighbors started asking for more! The result was a moist, DARK-chocolate brownie. Be prepared for a definite tart taste from the rhubarb. Your friends may not be a able to figure out what’s in the brownies, but if they’re fans of dark chocolate they’ll definitely be happy. 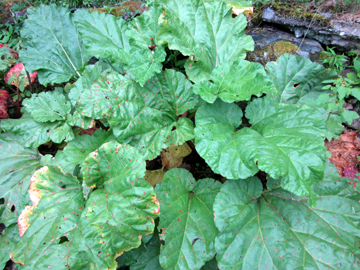 By the way, High Altitude Rhubarb has a number of recipes available on it web site. My family is lobbying to try the rhubarb margaritas! In a 2-quart saucepan melt the butter. Stir in the rhubarb, followed by the sugar. Heat, stirring, over medium heat until the sugar dissolves. Remove from heat. Stir in the cocoa and salt. Beat in the eggs 1 at a time. 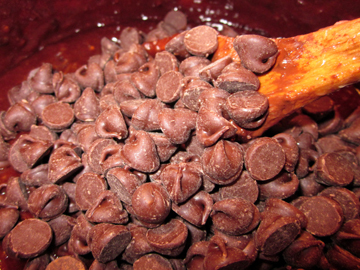 Stir in the flour, followed by the vanilla and the chocolate chips. Bake the brownies for 25 minutes. Remove them from the oven. Loosen the edges gently with a table knife; then allow the brownies to cool. Cut into tiny pieces. Makes between 20 and 40 brownies, depending on how big you cut them. This entry was posted on Monday, June 21st, 2010 at 4:00 am	and is filed under Cookies and Bars, Rhubarb. You can follow any responses to this entry through the RSS 2.0 feed. You can leave a response, or trackback from your own site. There goes my afternoon -lol – these look outrageous! Oh – dear … another problem ……. is Dutch process cocoa different to ordinary cocoa? Apart from that, it looks like a brilliant recipe!! Sorry to interfere with your plans, Andrea! Frayed, Dutch-process cocoa is less acidic than regular. Some sources say you may just use regular. Others, like Joy of Baking (below), want you to add a little baking soda. Good luck! Yum Yum Yum! Anything with dark chocolate has my name all over it. I love all your rhubarb recipes, Tinky…keep ’em coming! There’s only one more to come, Abbey, and that involves — gasp — grilling. I hope I have the stamina. I am NOT a griller. 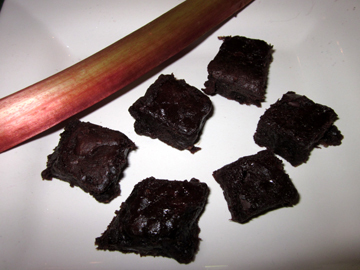 I never would have thought of rhubarb brownies. But I love dark chocolate and rhubarb, so why not? I vote yes on the rhubarb margaritas! OMG! Tinky!!! This sounds unbelievable. I LOVE rhubarb and dark chocolate is hard to resist. I’ll be blogging about you again!